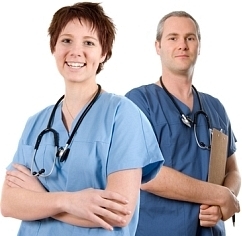 This active Medical Assistant Web Forum is maintained by Danni R., former Certified Medical Assistant, who has made her mark on the Internet by reaching thousands of medical assistant students, graduates and experienced medical assistants coast to coast through her well known websites and web forums dedicated to ALL medical assistants in the USA and abroad. Many medical assistant students and professionals have come and gone, leaving posts about their dreams, concerns and aspirations. Many reached out whenever possible to lend a helping hand to their peers in the true spirit of this profession! Thank you to all who have supported and contributed to this very active Medical Assistant Web Forum. Our Motto: "If Medical Assistants post it - Medical Assistants will reply!" I just started a job that I love & also badly need for financial reasons. I am 1 of 4 MA's at this practice and the only one who is certified. My problem is that a lot of what they are teaching me is incorrect; ie giving test results for things like RSV & flu before the required time limit is up, telling patients we'll call them but don't, logging in lab req's incorrectly. I have been hearing feedback also from my supervisor that the physicians are frustrated with lost test results, charts, and lack of initiative.Nobody picks up used gauze, wipes, etc if it falls on the floor during a procedure. Constant texting is also an issue. I am a good 15 years older than they are and am very aware that I am the lowest person on the totem pole, so to speak. They have 3-5 years experience working in this particular practice so while many procedures are the same, the operation of each practice remains unique so I must learn the correct way to operate. I am consciously avoiding behavior that is condescending...basically respecting their seniority. The problem is this: when I notice a procedure being done incorrectly I report it to my supervisor. (Done so in the form of a question asking for clarification. Again, not at all wanting to come off as a know-it-all.) My supervisor then will call a meeting to address us all on ensuring we are performing procedures correctly. Unfortunately my coworkers all know it's me who is reporting the problems and as a result I get blown off. They also seem to thoroughly enjoy pointing out any mistakes I make in charting. I'm still in training so I have to have seasoned eyes check my work. Ultimately this is leading to a tension-filled environment along with communication break-downs and longer patient wait times. I was told when I was hired that there were many problems in our department but I'm feeling frustrated in the unwillingness to be helped. To add to the tension all 3 fellow MA's speak the same native, non-English language, which further alienates me from the team. Has anyone experienced something similar? May I ask you all for opinions and advice? I love the job & want to be a strong member of the team but I'm really having trouble in what appears to be a clique-ish/ uncaring situation. I appreciate being able to voice my frustrations here. Thank you for reading! Hi, I've read your story and posted a link on the Medical Assistant Net facebook page, which ALSO has a large active group of medical assistants. Several have posted a response to you there (on facebook) and I wouldn't want you to miss it. Here is the link: https://www.facebook.com/medical.assistant.net - I hope you have a facebook. Let us know. I recently quit my first CMA job in December of 2014 for the same reasons you mentioned. I was hired at a family practice straight out of school and I had continual problems with the entire office. They were rude, condescending, and unwilling to help me learn anything. I was seriously re-thinking my career choice when I found out about another job opportunity through a friend. I got the new job, and I couldn't be more happy. The 10 months I spent at the first job helped me, even though I was miserable the whole time I worked there. I learned that not all offices are good places to work for someone straight out of school. But, working at a bad office will make you appreciate a different office once you're able to move on.